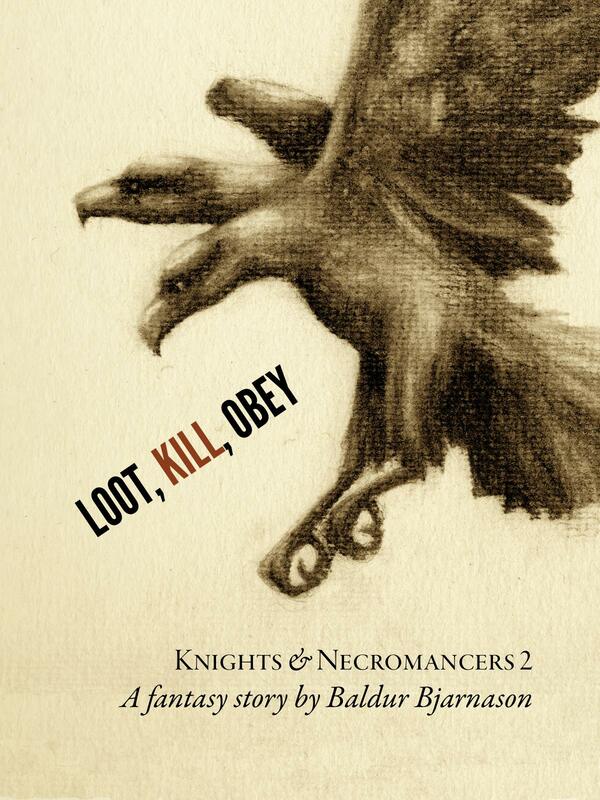 My second ebook, Knights and Necromancers 2: Loot, kill, obey, is available now from Amazon, iBooks, and Kobo. The wreckers have their shipwreck and their loot. Their next step is to get rid of the witnesses. Grace and Cera’s only hope is to make it to safety in Galti; a small fishing village ignored and forgotten by the outside world. With them are the remaining survivors of the shipwreck: two sisters who have just seen their entire lives sink down into the ocean and the destroyed ship’s first mate. Unfortunately for Grace, Cera, Hale, Kally, and Derek, the wreckers aren’t the only thing following them to Galti. Dainty aristocratic ladies with crossbows. A buff martial artist who fights with flaming fists. And an occasional moment of deserved and well-earned angst. While Loot, kill obey is the second story starring Grace and Cera it is my hope that it should work as a standalone read. While there are plenty of details from the first story that add to this one, very few of them are necessary for enjoying the yarn. It is available from Amazon.com, Amazon.co.uk, iBooks, and Kobo. I’ve also decided to offer the entire thing up for free on the web, at least for now. It’s an experiment. I haven’t made my mind up about it or whether to leave it up as an ongoing thing, so any and all feedback is appreciated. If you haven’t read Knights and Necromancers 1: Days of wild obedience then that’s still available for free (or for $0.99 on Amazon.com). Help yourself to a copy on Amazon.com, Amazon.co.uk, iBooks, Kobo, or direct from the Heartpunk website. Or, you can try the free online web reader. The first story has only had one review so far (and a pretty good one at that). Days of Wild Obedience works not only as a compelling gateway into an intriguing new world, it holds its own as a standalone novella, too. That said, I’m ready to jump into the next tale in the series, and I’m already imagining the RPG and movie! Definitely recommended. I would really, really, grateful it if those who have read Knights and Necromancers 1 wrote about what they thought of the story. It doesn’t have to be a review (although that’d be nice) and it doesn’t have to be positive (although that’d be nice as well). It’d make a huge difference if you could because working in a vacuum is worse than even getting negative feedback. This entry was posted in News and tagged ebook, fantasy, knights and necromancers, publishing, sword and sorcery by Baldur Bjarnason (@fakebaldur). Bookmark the permalink.